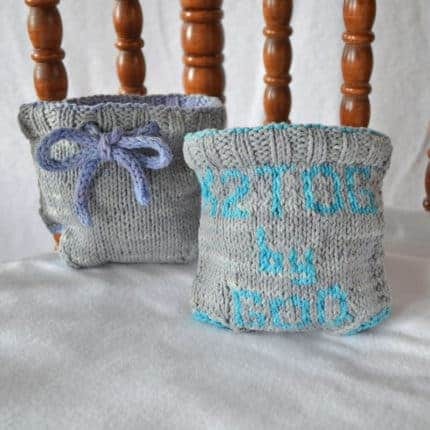 Inspired by Psalm 139:13 “For you created my inmost being; you knit me together in my mother’s womb” & Genesis 2:24 “That is why a man leaves his father and mother and is united to his wife, and they become one flesh,” “k2tog by God” diaper cover stamps the truth of God’s Word on the precious booty He just created. 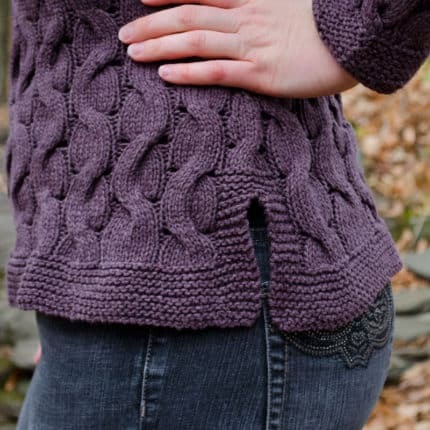 The tech edited and test knit pattern includes written directions, a chart & written directions for the lettering, a schematic, and a photo tutorial. 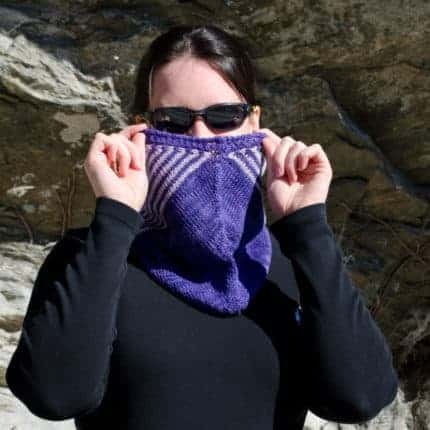 Triangles and parallelograms transform leftover linen yarn into a uniquely constructed shape shifting cowl that keeps the little grey cells engaged while actually being a simple knit. Pitch Cowl harkens to baseball stripes, geometry love, and bias construction, with just a touch of elegance in the top running edging. 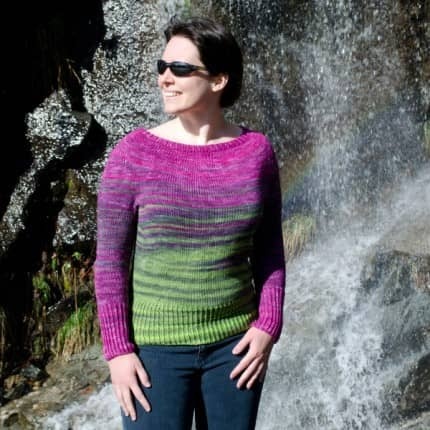 The tech edited & test knit pattern includes written directions and a work flow schematic. Check out the You Tube “Pitch Cowl Short Row Triangle Demo” for a demonstration on Triangle 2. Whether it’s concrete sidewalks or rustic trails that beckon you outdoors, grab your Alternating Paths sweater and hit the road enjoying fresh air and quality time with your family and friends, both human and furry. Your cheeks may be rosy when you arrive at your destination, but you’ll be warm and toasty, and looking great in your beautiful handknit sweater. Construction Notes: Completely Seamless! The bottom hem is worked in 2 pieces, allowing customization for a longer back than front or tunic length sweater. Then the body is worked in the round to the under arms. The upper back and chest are worked flat to the shoulders, which are joined using the three needle bind off method. (Alternatively, bound off and seamed.) After the rolled edge is added to the neck, the sleeves are set-in by picking up stitches and worked top down to the cuff. The tech edited and test knit pattern is fully written with the cable repeat charted. Whether careening down black diamonds, shredding fresh powder on a snowboard, zipping over moguls on downhill skis, creating your own trail backcountry on cross country skis, or enjoying the fastest way down via zipline, Zipline is your go-to accessory! 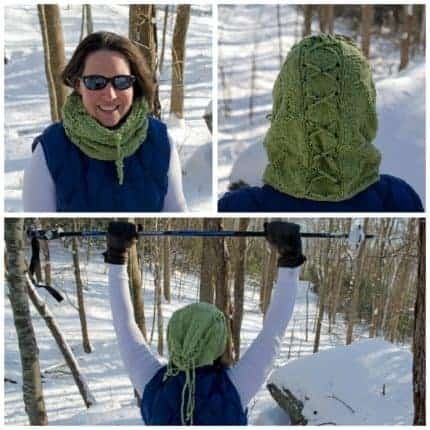 From sun up to sun down, this extreme winter sports inspired design keeps you covered from a snood in the early am, to a cowl when the sun shines off the white snow, to an emergency hat for one last run when the sun is setting the temperatures are going with it. 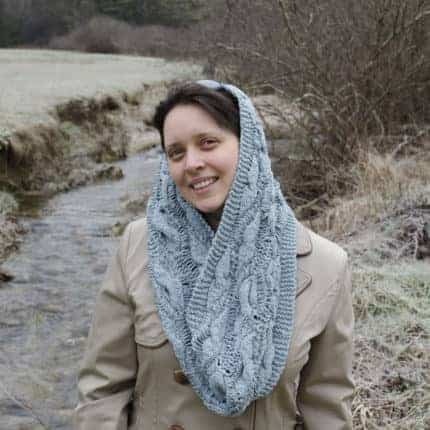 The tech edited and test knit pattern includes written directions and a chart of the textured pattern repeat to create a cowl, snood and a super slouchy hat. Twisting along the Appalachian Trail and passing not far from my home, the invisible line known as the Eastern Continental Divide diverts waters on the East to the Atlantic Ocean and on the West to the Gulf of Mexico. 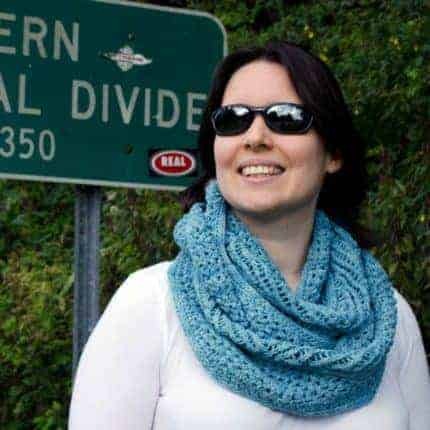 Eastern Continental Divide cowl mimics the incredible path a single drop of water travels upon falling either on the right or the left of the apex. Everything about this design is local – cotton grown and kettle dyed with eco dyes in Virginia, yarn purchased at my LYS in Black Mountain, NC, inspired by the Eastern Continental Divide and knit in my home close by it. To complete the local lovin’, the photo shoot took place just off the Blue Ridge Parkway between my home and the LYS, where an Eastern Continental Divide sign happened to be plotted right at a hiking trail head! Finish your chic ensemble in this Springtime in Paris inspired cowl as you float down the Seine River towards a romantic rendezvous at a French cafe. Drop stitches and wavy cables flow continuously with the movement of the river. Fresh croissants and cafe au lait won’t be the only tempting treats warming your heart. 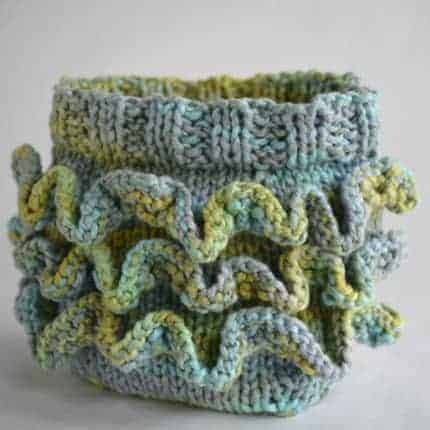 About the cuffs: I designed the Seine cuffs to conquer grafting fears before moving onto the Seine Cowl. Knit in just an hour, Seine Cuffs make the perfect gift-able knit, for old and young alike. Wear individually on one wrist or multiples in a row, mix and match drop cuffs with non-drop cuffs for a custom look all your own. Buy either pattern and get the other one free. These tech edited and test knit patterns include written directions, charts and a You Tube video. Easy knit and curvy fit for those cold fun days in the sun. The Unique Sheep’s gradient eco yarn provides the punch in this striking top down yoke sweater. For a glimpse of wow and inspiration to knit, see my blog post. Suggested skills for this easy level pattern include knit, purl, knit through the back loop, knit in the round, increase, decrease and short rows. The tech-edited and test-knit pattern includes written directions, a yarn color changing guide and a schematic. Note: if substituting a variety of solid colored yarns, the pattern creates a striping effect of differing, but flattering, widths. Ruffle the booty of your cutie in Knit Eco Chic’s debut baby pattern! Knit in organic cotton, this completely seamless design incorporates the self-hemming cast on. This super quick knit enables recreation over and over again as your little one grows from wearing newborn to extra-large diapers. Tech edited by Trisha Paetshch and test knit in a variety of fibers, this easy pattern includes written directions and a schematic in 15 organic disposal diaper-hugging sizes. With a plethora of styling options, the Shawl Pin Shawl’s versatility make it a must have for your wardrobe. An easy level knit, the unique dip in back is created with short rows in order to cover your back without adding bulk to the wings. Applicable for all seasons, select your favorite fiber for the weight you desire. Then show off your favorite shawl pin on the simplistic yet engaging design! 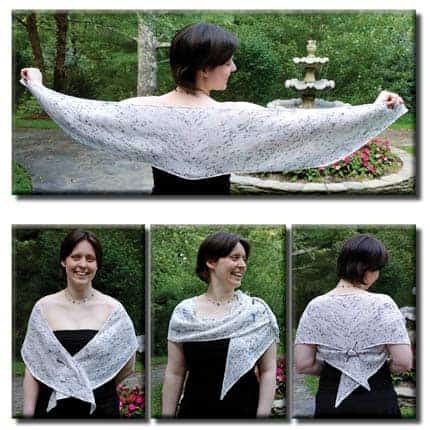 The unisex pattern comes in two sizes: the small – 10.5”/ 26.5cm deep by 64”/ 162.5cm wide – requires 2 skeins of yarn; the large – 12.75”/ 32.5cm deep by 74”/ 188cm wide – requires 3 skeins of yarn. Suggested prerequisite skills include: knit, purl, increase, short rows (wrap and turn or method of choice), and I-cord. Pattern has been tech edited & test knit. Check out the style blog here: Shawl Pin Shawl Style Guide.